With spring now upon us, it’s the perfect time of year to get cracking on spring cleaning around the house. Sometimes it can be tricky to know where to put all that excess rubbish or how to remove household waste or unwanted furniture. Let GrinnersSkips help you! 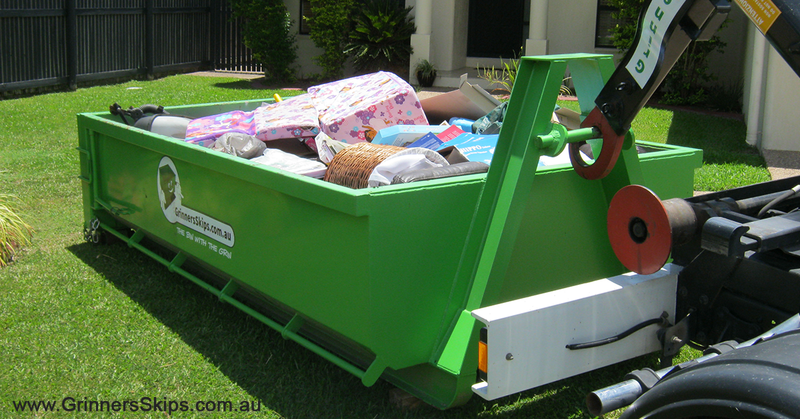 We provide Townsville’s best skip bin hire service, so let us do all the dirty work for you! Skip bin hire is often associated with businesses and being a family home, perhaps you’ve never thought to hire a skip bin. Council collection of hard rubbish can be useful but doesn’t necessarily happen exactly when you need it. GrinnerSkips provide bins and skips on demand, year round, whenever and wherever you need them. Spring is the perfect time to clean up your outdoor area, in preparation for outdoor entertaining during the upcoming warmer months. If you prune early enough your garden will flourish with fresh spring growth, and trees and plants will appear greener and more lush. Hiring our bins or skips means you can easily remove green waste and excess materials from your yard. So, why not clean out your shed while you’re at it?! Locally owned and operated, we offer the best value for money guaranteed. Hiring a skip bin will save you time and money, as well as the energy and equipment required to haul away your household items to the tip by yourself. Your trash may turn out to be another man’s (or lady’s!) treasure, so consider selling or giving away unwanted pieces of furniture. GrinnersSkips are serious about recycling and with your permission, we’ll always consider if we can upcycle or repurpose your furniture waste.